Alzheimer disease (AD) is now considered as a multifactorial neurodegenerative disorder and rapidly increasing to an alarming situation and causing higher death rate. One target one ligand hypothesis does not provide complete solution of AD due to multifactorial nature of the disease and one target one drug fails to provide better treatment against AD. Moreover, currently available treatments are limited and most of the upcoming treatments under clinical trials are based on modulating single target. So, the current AD drug discovery research is shifting towards a new approach for a better solution that simultaneously modulates more than one targets in the neurodegenerative cascade. This can be achieved by network pharmacology, multi-modal therapies, multifaceted, and/or the more recently proposed term “multi-targeted designed drugs”. Drug discovery project is a tedious, costly and long-term project. Moreover, multi-target AD drug discovery added extra challenges such as the good binding affinity of ligands for multiple targets, optimal ADME/T properties, no/less off-target side effect and crossing of the blood-brain barrier. These hurdles may be addressed by insilico methods for an efficient solution in less time and cost as computational methods successfully applied to single target drug discovery project. Here, we are summarizing some of the most prominent and computationally explored single targets against AD and further, we discussed a successful example of dual or multiple inhibitors for same targets. Moreover, we focused on ligand and structure-based computational approach to design MTDL against AD. However, it is not an easy task to balance dual activity in a single molecule but computational approach such as virtual screening docking, QSAR, simulation and free energy is useful in future MTDLs drug discovery alone or in combination with a fragment-based method. However, rational and logical implementations of computational drug designing methods are capable of assisting AD drug discovery and play an important role in optimizing multi-target drug discovery. 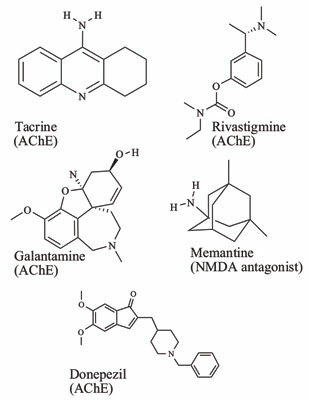 Alzheimer's disease, AChE inhibitor, anti-amyloid inhibitor, BACE1 inhibitor, multi-target-directed-ligands (MTDLs), classical and non classical drug targets, computational drug discovery.